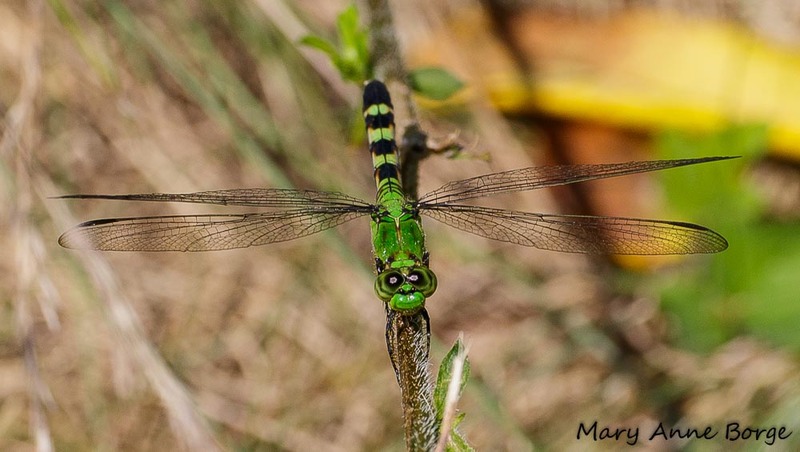 Eastern Pondhawks (Erythemis simplicicollis) are dragonflies that perch when they hunt, usually on low foliage or on the ground. Dragonflies are carnivores. They eat other insects ranging in size from tiny mosquitoes to dragonflies their own size, or for some dragonfly species, even larger. 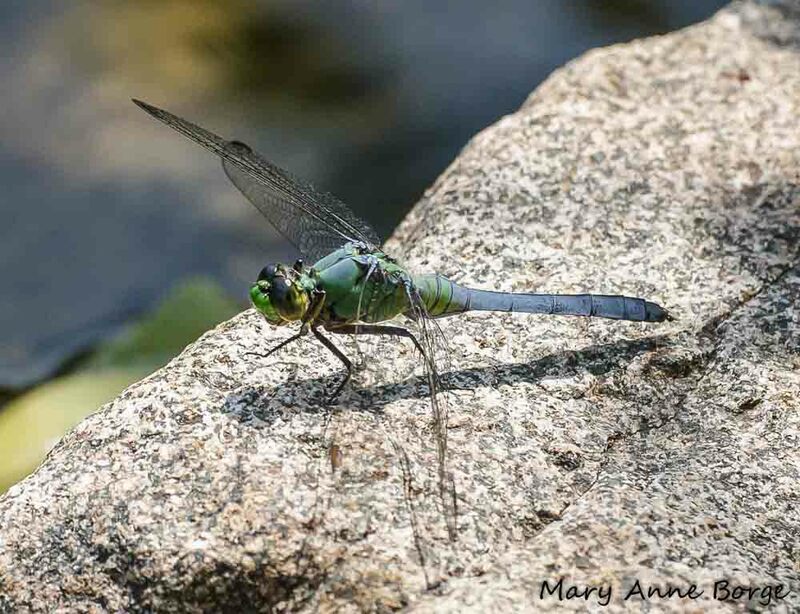 Dragonflies lay their eggs in or near ponds, streams and lakes. After the eggs hatch, their larvae develop in the water body, where they eat other aquatic insects, including mosquito larvae. They may even eat tadpoles. it is able to instantaneously calculate the speed and trajectory of its target’s flight, and determine the necessary speed and path for the dragonfly’s own flight, a calculation that will enable the dragonfly to expeditiously intercept its hapless quarry. The world’s military forces have spent billions trying to replicate this capability! Dragonflies themselves are prey for other animals, including spiders, tiger beetles, frogs, even fish, and birds such as flycatchers. 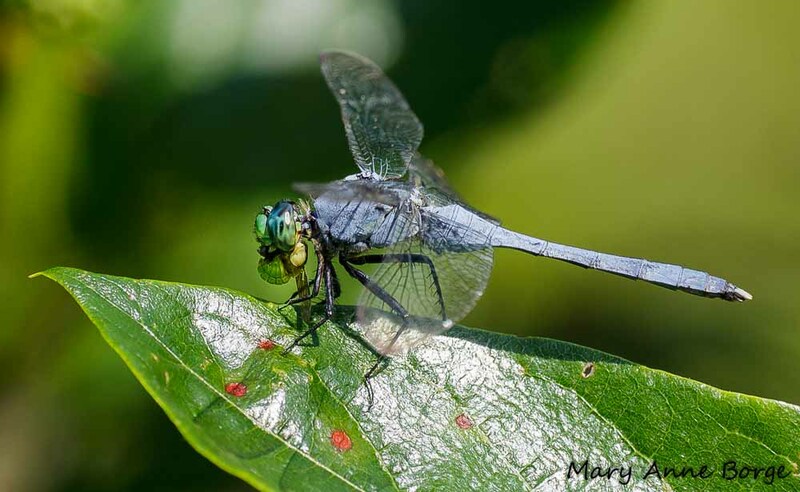 A dragonfly’s broad range of vision can help alert it to the presence of a predator. Its only blind spots are below its body and directly behind its head. 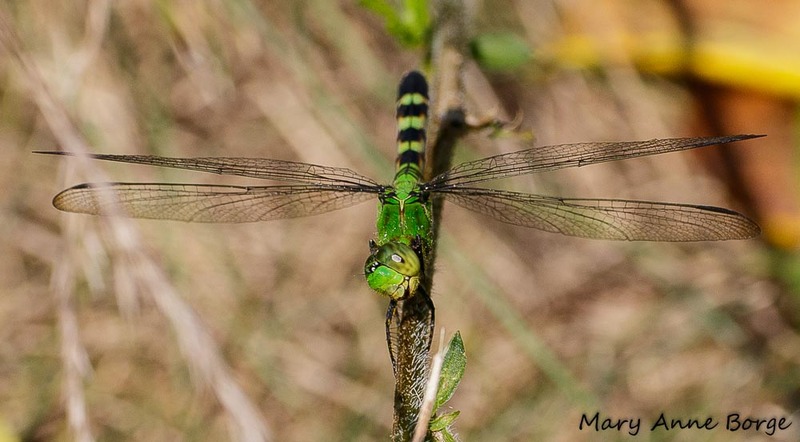 Hunting from ground level as Eastern Pondhawks do compensates for one of those blind spots. 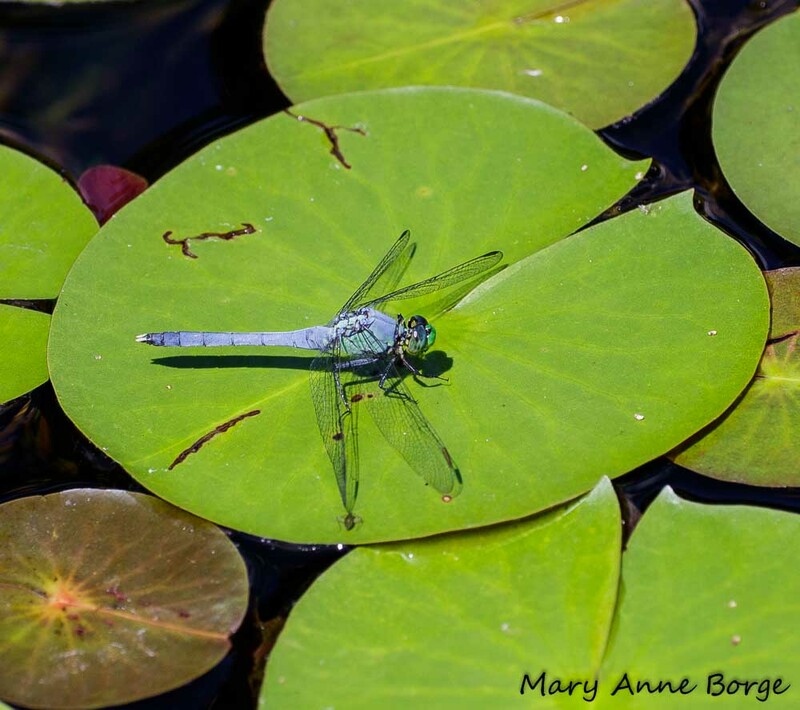 A perch on a water lily leaf may leave a dragonfly vulnerable to aquatic predators like frogs or fish. But a rock or other ground surface is usually pretty safe from predators from below. Any of these perches offer a suitable takeoff surface for an Eastern Pondhawk to launch into flight and snag its next meal. 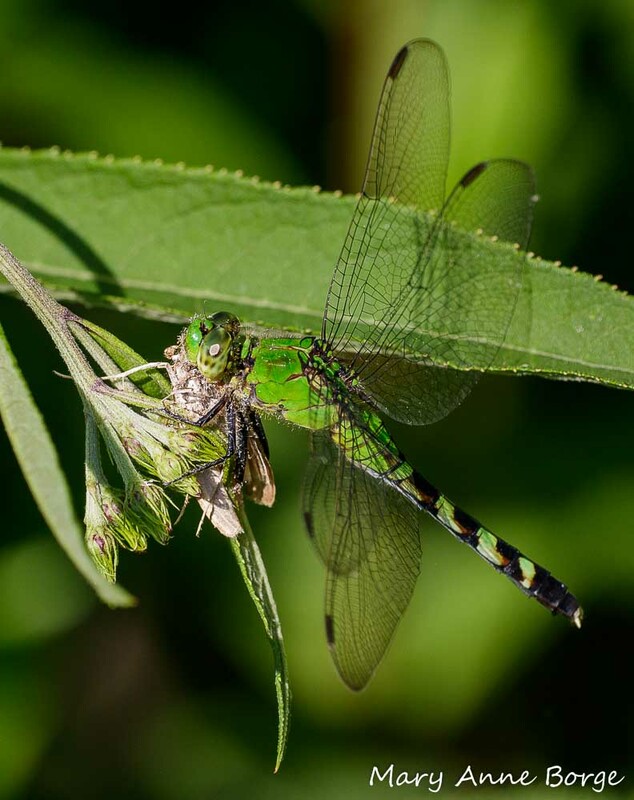 Look for Eastern Pondhawks in the neighborhood of any vegetated wetland. Paulson, Dennis. Dragonflies and Damselflies of the East. 2011. 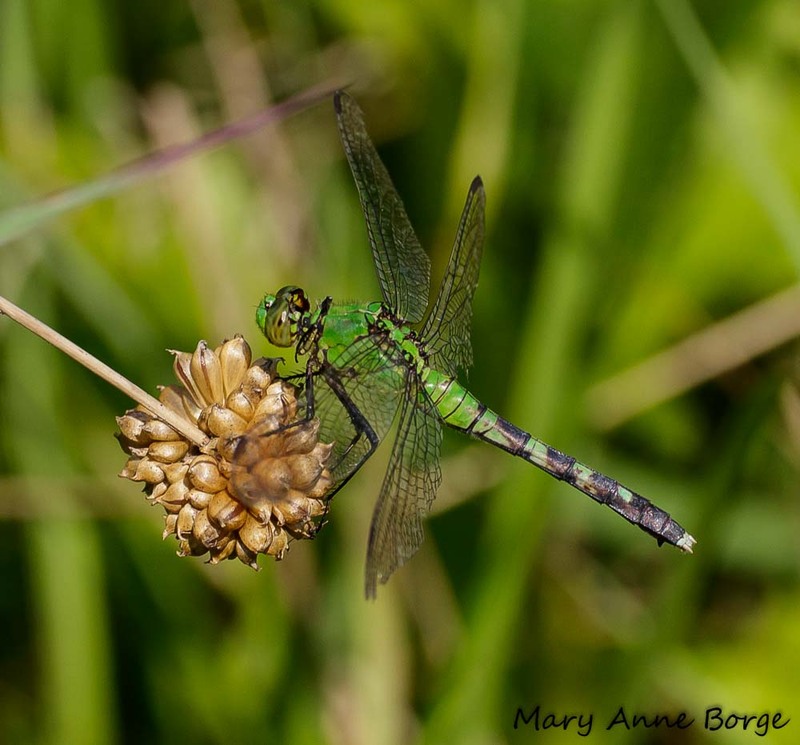 This entry was posted in Nature, Other Insects and Spiders and tagged dragonflies, Eastern Pondhawk, Erythemis simplicicollis, Natural mosquito control by Mary Anne Borge. Bookmark the permalink.